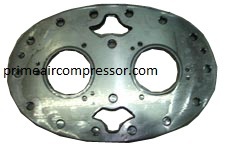 Refrigeration Compressor Parts : Air Compressors & Parts, Ingersoll Rand, Altas Copco, Elgi..
We are manufacturer of refrigeration compressor parts. We keep thousands of parts for refrigeration compressors for Sabroe, Carrier, Kirloskar, Grasso, Voltas, Accel, Trane, York, Utility, Blue Star, Alfa Level, Stal, Mycom, Daikin, Baltiboi. We keep parts like Connecting Rods, Main Bearings, Connecting Rod Bearings, Cylinder Liners, Pistons, Piston Rings, Gaskets, Shaft Seal Assembly, Oil Pump Assembly, Crankshafts, Valve Plates, Valve Reeds, Seals, Piston Pins, Connecting Rod Bearings & Many more..